Oasis Games is pleased to announce that Final Fantasy Awakening, authorized by SQUARE ENIX, has officially launched today at Sydney time 11:00 am for Android devices in Australia, New Zealand, Philippines, India, Laos, Cambodia, and Burma, with an iOS version coming soon. Designed especially for mobile devices, the new 3D ARPG has inherited the unique fighting style, rich storytelling, and stunning graphics of previous console-based installments in the "Final Fantasy" series. Final Fantasy Awakening has stayed true to its roots with more than 200 high-quality cinematics and the original Japanese voice actors: Hanazawa Kana (Deuce), Kaji Yuuki (Ace), Nakamura Yuuichi (Trey), and more. The game hopes to provide the most immersive game experience possible to all the players. Furthermore, the game offers a series of characters for players to try out, including the card-wielding Ace, who is the first person met by the Cadet; Deuce, known as "Voice of Healing," who uses the music from her flute to attack enemies; and the newest Class Zero member, Rem--or "Blades of Shadow"--who uses two sharp daggers to attack her enemies. All of the original 14 Class Zero characters from the original game series will be returning, as well as plenty of vivid new characters for players to try out. 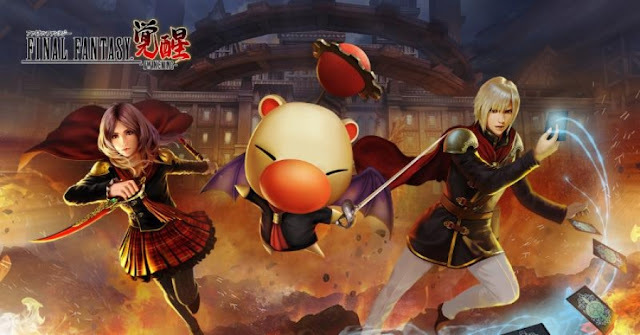 Final Fantasy Awakening features high-speed, action-based combat and requires strategy based on the various moves and fighting styles of each of the original Type-0 fourteen warriors. Furthermore, there are other multiple characters for players to experience. Players can recruit or unlock new characters to add to their teams. By leveling up, players will also be able to claim in-game funds to enhance the skills and equipment of the whole team. The game inherited the original trinity battle form which three players out of the team can cast their ultimate strokes together on the enemy. Based on this, Final Fantasy Awakening extended the diverse 1+2+2 battle form, which players can switch two characters in the team to the rest two in order to cast their final skills. Specific to different battle scenarios and according to the current characters' skills, players can flexibly adjust the battle formation time by time during battles to achieve the final victory. Players may even summon Eidolons to shift the course of an epic battle. For more information, visit the Final Fantasy Awakening site at https://mffaen.oasgames.com/.